The Archives and Special Collections Center at Seton Hall University is pleased to announce the acquisition of the Donald M. Payne papers, a new manuscript collection of congressional papers from the late Donald M. Payne, a member of the United States House of Representatives from New Jersey’s 10th district from 1989-2012. 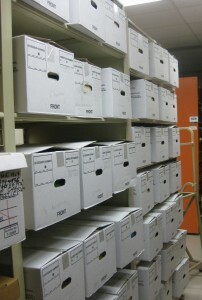 The Payne papers in the A&SCC. Donald Payne was born and raised in Newark, N.J., and graduated from Seton Hall University in 1957. He became the first African American Congressman from New Jersey when he was elected to the House of Representatives in 1988, and served ten consecutive terms. During his time in Congress, Representative Payne served on the Committee on Foreign Affairs and the Committee on Education and the Workforce. Mr. Payne died in 2012 and was succeeded in Congress by his son, Donald Payne, Jr. The Donald Payne papers document Representative Payne’s time as a congressional representative, including legislative documentation, research files, newsclippings, photographs, and audio-video recordings. About 43 linear feet of materials have been accessioned by the A&SCC, and the materials will soon be processed and made available to researchers. The A&SCC and University Libraries are very excited to have acquired this important collection of political papers and look forward to connecting this material to users. Stay tuned for more information!